Colonies on potato dextrose agar at 25°C grow rapidly and are initially white, becoming dark gray to nearly black at maturity. Colonies are floccose to powdery to granular. Hyphae are septate and hyaline to subhyaline. Conidiogenous cells are cylindrical, occur singly or in loose groups, and have a slightly swollen base and a long annellated zone (5-15 x 2.5-5.4 µm). 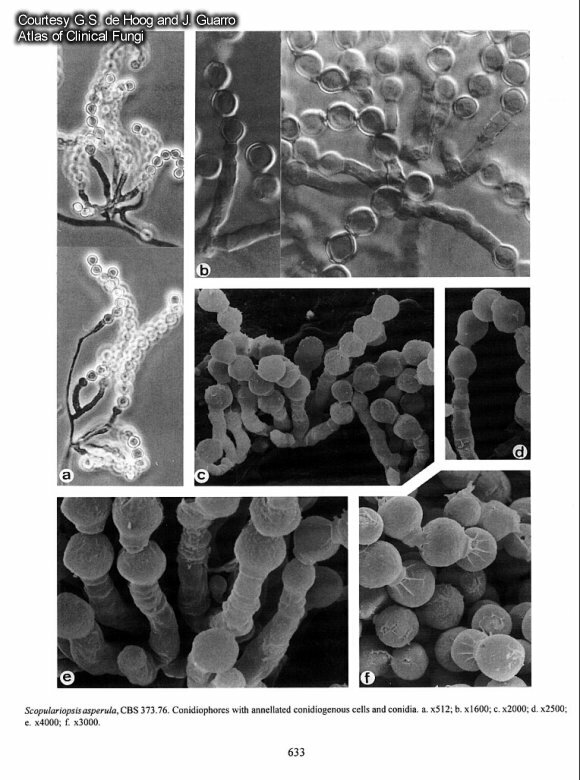 Conidia are dark in mass, occur in chains, measure 5-8 x 5-7 µm, and are spherical to ovoidal, truncate with a distinct frill, rough-walled, and have a rounded or pointed apex. , . Scopulariopsis asperula has been reported as an agent of onychomycosis .